I apologize to the reader in advance for what will probably seem like the dullness of the subject matter. Roman politics is not going to seem very interesting, I suspect. Since this post will be long enough, I'm going to attempt not to make it still longer by explaining all the background for each of the examples. Plutarch's Lives are all available in translation on-line, so if you want to understand more about what is going on or even just help your head to stop spinning about who is making alliance with whom or what happened in a battle, please look up the texts for yourself. In fact, I strongly encourage you to do so if you are curious about the strength of the case for these "compositional devices" in ancient authors or if you want to check on whether I have summarized accurately. In case one had any doubt as to whether "conflation" means "getting confused and narrating the two events as one in good faith," Licona expressly says that there is always some degree of "displacement" and/or "transferal" when "conflation" is taking place, and these are defined in explicitly deliberate terms. So "conflation" as Licona defines it is deliberately making it sound like what you know or believe to be different events were just one event. The section of Plutarch in question here, discussed by Licona on pp. 51-52, concerns a time period when Cicero had been exiled from Rome and Pompey was deciding that he needed to change his political focus and support having Cicero's banishment reversed. (In this discussion, when one puts a name or abbreviation of a name in italics, that usage refers to the name of one of Plutarch's Lives. The un-italicized name refers to the person.) Licona says that Plutarch, in Pompey, compresses and conflates the account of the series of events leading up to the vote to have Cicero returned. Here is Licona's analysis by which he argues for these "devices" in Plutarch. In Cic. 33.1-5, Pompey’s actions to recall Cicero from banishment occurred in three stages: (1) Pompey and Cicero’s friends attempted to have Cicero returned, but Clodius opposed them. (2) After Clodius’s time in office expired, violence occurred in the Forum on 23 January 57 where Cicero’s brother (among others) was injured and believed to have been killed. (3) In response, one of the tribunes prosecuted Clodius for violence, and many people began changing their minds and came from the cities surrounding Rome to join Pompey. With these, Pompey drove Clodius from the Forum and summoned the people for a vote, which occurred on 4 August 57. However, when Plutarch tells the same story in Pomp. 49.1-4, he compresses and conflates the action into one stage: Pompey escorted Cicero’s brother with the people into the Forum, where some were wounded, others killed, and Clodius was defeated. A point to be made at the outset is that none of these dates occurs explicitly in the Plutarch passages cited. Licona repeatedly writes of highly specific dates in Plutarch as though they occur in the text, but they don't. It may well be that the inference that those dates were intended or implied by Plutarch is extremely secure, historically, based on independent information. But Licona doesn't give that independent argument, and the statement that such-and-such event occurs on such-and-such a date in this Life gives a somewhat confusing impression that Plutarch writes with explicit dates when in fact he doesn't. When one actually turns to Pompey and Cicero, one is hard-pressed to find the compression and conflation that Licona alleges. In fact, I would go so far as to say that there is not even any apparent discrepancy between the two works as to how long all this took. The most that can be said is that the narrative in Pompey is shorter and less detailed concerning these events, but they appear to be entirely compatible. It is an example of Licona's odd woodenness and over-reading that he takes the relative brevity of the narrative in Pompey to mean that Plutarch is writing of different events as if they are one event and writing of a series of events deliberately as if they take place over different periods of time. This sort of over-reading comes up repeatedly in the book. 1 As for Clodius, after driving Cicero away he burned down his villas, and burned down his house, and erected on its site a temple to Liberty; the rest of his property he offered for sale and had it proclaimed daily, but nobody would buy anything. 2 Being therefore formidable to the patricians, and dragging along with him the people, who indulged in great boldness and effrontery, he assailed Pompey, attacking fiercely some of the arrangements made by him on his expedition. 3 The disgrace which this brought upon Pompey led him to reproach himself for his abandonment of Cicero; and changing front he used every effort to effect Cicero's return, and so did his friends. But since Clodius opposed himself to this, the senate decided to ratify no measure that came up in the mean time and to do no public business, unless Cicero should be permitted to return. 4 During the consulship of Lentulus, however, when the disorder went on increasing, so that tribunes were wounded in the forum and Quintus the brother of Cicero lay unnoticed for dead among the slain, the people began to change their minds, and Annius Milo, one of the tribunes, first ventured to prosecute Clodius for violence, and many joined themselves to Pompey both from the people and from the surrounding cities. 5 With these Pompey came forth, drove Clodius from the forum, and summoned the citizens to the vote. And it is said that the people never passed any vote with such unanimity. 6 The senate, too, vying with the people, wrote letters of thanks to all the cities which had ministered to Cicero during his exile, and decreed that his house and his villas, which Clodius had destroyed, should be restored at the public cost. Here, from Pompey 48.7-49.4, is the passage that supposedly "conflates and compresses." What is mainly noticeable from comparing the passages is that Pompey expands upon Clodius's insults to Pompey (I didn't even include all of the discussion of how Clodius disses Pompey), which contributed to Pompey's dissatisfaction with his ally, and that the passage in Pompey simply writes more briefly and with less detail of the attempts to have Cicero recalled and the violence leading up to the recall of Cicero. In Pompey Plutarch also implies that there was some violence in the forum even before the expiration of Clodius's time as tribune, which is of course compatible with growing violence after that. Pompey also does not happen to state at what point in all of this Clodius's term in office expired. None of this is anything like writing of two different events as one or implying that the events took less time than they did. In fact, contra Licona, in Pompey the series of events clearly takes some period of time. Pompey adds the claim that someone was trying to approach Pompey with a sword and that Pompey made this his excuse for not coming into the Forum for a while. Instead, he stayed at home and debated with his friends what he should do. So, just as in Cic., there is some period of time between Pompey's first disaffection with Clodius and before the final ousting of Clodius’s sympathizers. Eventually, in Pomp., Pompey went into the Forum with a large force, had a skirmish with Clodius, and was victorious in getting a law passed for the recall of Cicero. This is all completely consistent, even easily consistent, with the events related in Cicero. There is not even any appearance of “compression and conflation” as fictionalizing devices but merely of somewhat differing details given and less length of writing and detail overall given in some parts of Pompey. The reference in Cicero to “driving” Clodius from the Forum, for example, fits perfectly with the reference to some being wounded and killed in that confrontation in Pompey. Presumably that would happen if the crowd literally had to drive Clodius and his supporters out. As for Cicero’s brother, Quintus, one guesses that perhaps Licona’s case for “conflation and compression” into "one stage" is based on the fact that the account in Cic. mentions the brother in reference to the earlier violence in the Forum, whereas the account in Pomp. mentions his being escorted into the Forum by Pompey as part of his final, successful effort to drive Clodius out. But this is an extremely poor argument, if that’s what Licona is implying or relying upon. Why should Cicero’s brother not have been in the Forum both times, been wounded in general violence one time, and then been escorted safely later when there was a stronger force supporting Pompey's bid for Cicero's return? After all, Pompey even says that there was fighting and danger in the forum while Clodius was tribune, so it's not as though all was serene in the forum before the final confrontation. And if Quintus was deeply involved in trying to get Cicero’s return voted for, his presence in the forum on more than one occasion is highly plausible. In one case he is said to have been wounded in the course of mob violence, while in the other he is said to have been escorted in with a large and successful force, so there is every reason to think that these refer to two entirely different occasions on which Cicero’s brother was in the forum. The ostentatious act of "escorting" him would actually make sense if he had been injured earlier, and he would presumably have been an especially sympathetic figure to the supporters of Cicero, both as Cicero's brother and as someone who was hurt in a riot earlier. The previous violence is apparently being attributed to the absence of Cicero himself. Pompey simply does not mention Quintus's having been injured earlier. The fact that Licona makes no argument on this point but simply asserts the so-called literary devices leaves one flailing to construct such an argument. Could the supposed problem be that Pompey does not bring up Pompey's decision to try to have Cicero returned until just before the narrative of the successful confrontation with Clodius? But that would be an incredibly weak argument based (again) on an extremely wooden over-reading, as though in Pompey Plutarch said or even implied that Pompey made the decision to yield to the arguments of Cicero's supporters and then immediately went out, got together a force of people, and marched into the forum. But really, the exact time relation between his decision to support Cicero's return and the final confrontation in the forum is simply left unspecified in Pompey, while Cicero states, giving more detail on this point, that Pompey made political efforts in that direction while Clodius was tribune. One wonders if that could have been what occasioned the attempted assassination of Pompey, mentioned in the other account (Pompey). Otherwise it is a little odd that Clodius would have tried to have Pompey killed when he seems merely to have despised him and to have enjoyed making his life difficult. I can't resist pointing out that I have now suggested two possible undesigned coincidences between the accounts in Plutarch that Licona is placing at odds with one another: One concerns the possible reason for escorting Cicero's brother into the forum (because he, a person connected with the political cause in question, had been wounded in violence in the forum earlier). The other concerns a possible reason for the assassination attempt against Pompey (because he was opposing Clodius on the matter of Cicero's return). The ways in which the accounts fit together are so natural and uncontroversial that it is difficult to see why one would think that there are fancy "compositional devices" in Pompey. Plutarch seems to have told the same events consistently but with different emphases in terms of length and detail. This is a case of making an apparent tension between accounts where no tension exists and then using that manufactured tension as an opportunity to allege a fictionalizing compositional device. This example, and many others, make me wonder if I should have another node of the flowchart right after "The accounts contain differences" that says, "So what?" or, more clearly, "Do these differences rise to the level even of an apparent discrepancy?" William Paley noted long ago that the normal characteristic of truthful testimony is substantial agreement with circumstantial variety. Redaction critics and others with literary axes to grind seem instead to take any difference whatsoever, even if it falls entirely within the normal scope of non-contradictory variation, to be an opportunity for hypotheses of non-factual alteration--in this case, "compositional devices." Here is another example: On pp. 64-66, Licona raises the question of who called Caesar a bandit/robber and who called for him to be required to lay down his arms by a certain day under pain of being considered a public enemy. Here Licona alleges conflation and transferral. Here I am not going to quote long passages, but feel free to look them up for yourself. Plutarch's Life of Caesar is here. His Life of Pompey is here. It's easy to find the references by searching on the page for the chapter number and then reading the relevant portion. Licona is correct to say that, in Caesar, Plutarch mentions that Scipio introduced a motion to declare Caesar a public enemy if he didn't lay down his arms by a certain date, and this motion by Scipio is not mentioned in the parallel passage on the same events in Pompey. Similarly, in Caesar Lentulus makes the comment about a robber and arms, whereas Lentulus's comment is not mentioned in Pompey, but a similar comment is attributed to Marcellus. Marcellus also makes the proposal in Pompey about requiring Caesar to lay down his arms. Here I want to invoke my idea of interpreting ancient documents in light of experience of the real world. If one thinks of these as real, nasty, political debates, it is easy to imagine how all of these things might have happened. These are all opponents of Caesar. There is nothing remotely contradictory or problematic about Scipio’s introduction of the motion requiring Caesar to lay down his arms by a certain date and Marcellus's urging the same motion. (This is all happening at around the same time.) The statement that Caesar was a bandit and that arms rather than negotiation are appropriate in response to a bandit was plausibly something that multiple opponents were saying. Has Licona, or have classicists, never heard of “talking points”? Must we forget, when interpreting ancient texts, how often politicians who agree with each other echo each other? Why think that Plutarch “conflated and transferred” the "logia”? Calling the comments made in political debate by Lentulus, Marcellus, and Scipio "logia" adds a false air of literary artificiality to the entire interpretation. These statements are immediately classified in the mind of the reader as something like Internet memes or famous quotations that were originally uttered by one person rather than another and then were falsely attributed to someone else. But one could just as easily think of these as negative things that politicians were saying and proposals they were bringing up concerning how to deal with Caesar. The unnecessary application of literary categories rather than the natural application of historical imagination creates a manufactured opportunity for attributing a "compositional device" via the artificial question, "Who said this?" as if only one person could have said it. The next example I'll discuss concerns the question of whether Marc Antony was personally present at a particular battle against the forces of Cassius. (This was after the assassination of Julius Caesar.) Licona alleges (p. 106) that, in one of the Lives, Antony is present at a certain battle against Cassius while in another work he is absent. It is unclear what device Licona is alleging here. He explicitly says that "there is a difference" on this point between Brutus and Antony as well as on the question of whether Octavian (later Caesar Augustus) was present at the first battle with Brutus's forces. Since throughout this section Licona is talking about how Plutarch is influenced by his desire to portray the main character of a particular Life, and his adversaries, in certain ways, the implication may be that Plutarch is trying to portray Antony more positively in his biography by "having" him present at a battle where his forces are victorious. Licona does not say, but he definitely alleges a discrepancy between the accounts on this point. Licona specifically alleges that the portrayal of Octavian as absent in the account in Brutus may be there for purposes of portraying Brutus's antagonist in a negative light. To avoid being even more tedious, I won't discuss here the artificiality of the alleged discrepancy concerning Octavian but will focus on the one concerning Antony, which I can discuss more briefly. I have notes on the alleged discrepancy about Octavian and can discuss it more in the comments thread if asked. There is a difference pertaining to whether Antony and Octavian were present at the first battle. In Brut. 41.1 and 42.2b– 3a, neither Antony nor Octavian were with their armies in the first battle. At the beginning of the battle, Antony went away to a marshy area, and Octavian was nowhere to be seen after his friend Marcus Artorius described to him a dream in which Octavian was commanded to leave the camp. However, in Ant. 22.1– 4, Antony was victorious everywhere (22.1), and Caesar (the name given here rather than Octavian) narrowly escaped secretly when his camp was overrun by Brutus. Plutarch reports that Caesar (i.e., Octavian) says in his Memoirs that he had left camp prior to the battle as a result of a friend’s dream (22.2; cf. Brut. 41.4). He adds that some assert that Antony was also absent from that battle but came afterward while his soldiers were chasing the enemy (Ant. 22.3; cf. Brut. 42.2b– 3a). A few days later, Antony defeated Brutus in a second battle while Caesar (Octavian) was sick (22.4). So there were conflicting reports pertaining to whether Antony and Octavian were present with their armies when they were victorious. In Brutus, Plutarch says Antony and Octavian were absent from the first battle, whereas they were present in Antony. Notice the definite assertion that both generals were present in the account in Antony. Earlier in the passage, Licona gets Antony's presence from the statement that "Antony was victorious everywhere." But then notice an oddity: Midway through the paragraph, Licona says, "[Plutarch] adds that some assert that Antony was also absent from that battle but came afterward while his soldiers were chasing the enemy." Wait, what? Does Plutarch say that in Antony? But I thought you were setting up a difference on precisely this point between Antony and Brutus and were saying that the sentence, "Antony was victorious everywhere" in Antony means that he was personally present, unambiguously, at the first battle. To make it weirder, after this concession, Licona goes on to state without qualification that both generals were present at the first battle in Antony. As Licona's passing concession shows, and contrary to his summaries that sandwich the concession, there is actually no discrepancy, nor even an apparent discrepancy, between Antony and Brutus on the question of whether Antony was personally present at the first battle with the forces of Cassius. It is actually quite baffling as to why Licona alleges a difference on this point at all, since evidently he did notice Plutarch's careful statement in Antony that some sources report that he was not personally present. 2 Neither of the generals was with his men; 3 for Antony, we are told, turned aside from the attack at the outset and withdrew into the marsh, and was nowhere to be seen after he had forsaken his camp; indeed, sundry soldiers declared that they had slain him, showing Brutus their bloody swords and describing his youthful appearance. 4 But presently the centre drove back their opponents with great slaughter, and it appeared that Brutus was completely victorious, as Cassius [who was opposed to Antony] was completely defeated. 1 However, after they had crossed the sea, taken up war, and encamped near the enemy, Antony being opposed to Cassius, and Caesar to Brutus, no great achievements were performed by Caesar, but it was Antony who was everywhere victorious and successful. 2 In the first battle, at least, Caesar was overwhelmingly defeated by Brutus, lost his camp, and narrowly escaped his pursuers by secret flight; although he himself says in his Memoirs that he withdrew before the battle in consequence of a friend's dream. 3 But Antony conquered Cassius; although some write that Antony was not present in the battle, but came up after the battle when his men were already in pursuit. So Plutarch makes it clear that the phrase “Antony was everywhere victorious” doesn’t have to mean that Antony was personally present, since just a couple of verses later Plutarch casts explicit doubt on that proposition! The earlier sentence presumably refers to the forces of Antony--the "Antony team," as it were. Indeed, one can even view the statement that some report that Antony wasn’t personally present at the first battle as an attempted correction of any misimpression that might have been given by the earlier sentence about Antony's being "victorious and successful." This, again, is a case of over-reading, even when Plutarch himself is careful to be clear. Licona thus creates a discrepancy where none exists. Obviously, I cannot possibly go through and write similar analyses of all of the Plutarch examples. A great many of them concern the non-device "device" of "spotlighting," which I discussed here. So, too, with the overly literary name for the so-called "law of biographical relevance," which simply means that you talk about some things that are more relevant to your subject matter in one biography rather than another. This so-called "device" or "law," like "spotlighting," provides no support whatsoever for fictionalizing devices. When it comes to the claims of fictionalizing "devices," again and again one finds no real discrepancy at all upon investigation, and sometimes one scarcely even needs to bother harmonizing, as there is nothing to harmonize. In some cases, as with regard to Curio's attempt to bring about a compromise between Caesar and the Senate, Licona (pp. 64-65) reads Plutarch as giving a definite chronology to events where one could just as easily regard Plutarch as not trying to imply any highly specific chronology but simply "chunking in" political events that happened at approximately the same time. Narrative order need not even appear to be strict chronological order. Again, over-reading gives rise to supposed "compositional devices." What this means is that most of these claims do not even get past the first step of the flowchart, above. Either there is not even an apparent discrepancy, or the supposed "discrepancy" can be resolved in a plausible way. I want to discuss one of the few places where, as far as I can tell, there is a real discrepancy between two of Plutarch's Lives. At that point we can see how such an example stalls on the second stage of the flowchart. Once more, therefore, Pompey was in ill repute, 5 and this was still further increased because, although he had put a stop by law to encomiums on persons under trial, he himself came into court to pronounce an encomium on Plancus. Cato, who happened to be one of the jurors, clapped his hands to his ears and said it was not right for him, contrary to the law, to listen to encomiums. This is pretty unambiguous. Nor is it a case of merely saying, "Joe and Anne are building a new house" where this is shorthand for, "Joe and Anne are paying contractors to build them a new house." Plutarch appears to be emphasizing Pompey's personal action. But in Cato Minor 48.4, Plutarch states clearly that Pompey wrote the encomium and had it read. Moreover, though Pompey himself had made illegal the customary panegyrics upon men under trial, he wrote a panegyric upon Munatius Plancus and handed it in at his trial; but Cato (who chanced to be one of the jurors) stopped his ears with his hands and prevented the reading of the testimony. Unlike many examples in the book, both secular and scriptural, this is a fairly clear-cut case of a discrepancy. Licona, of course, states without the slightest hesitation that this is a literary device of transferal. Licona does not pause to offer any argument whatsoever that Plutarch's change here between the two Lives is a deliberate alteration of the truth. This is consistent with Licona's practice throughout the book. Having alleged a "difference" or discrepancy, he merely asserts a literary device, jumping over several stages of argument in one flying leap. He does not argue, for example, that Plutarch must have known while writing Pompey that Pompey did not personally come into court. Note that it is not enough to show that Plutarch knew or believed this at some time, which is evident from Cato Minor. One should provide some good reason to think that he knew it at the time when writing the document that asserts the contrary and therefore that his change must have been a deliberate abandonment of fact. Otherwise, the difference can be quite readily and more simply explained by his remembering the story wrong (if, for example, Cato Minor was written first and Plutarch didn't check his notes) or gaining new information in between writing the two documents (if Pompey was written first). No deliberate intention to alter the truth is necessary as an explanation if one has no reason against either of these possibilities. One might think that that level of forgetfulness is unlikely. This would be relevant if one had in hand an argument that Cato Minor was written first and if one also thought it unlikely that Plutarch in the meanwhile received some information that seemed to indicate (perhaps incorrectly) that Pompey came into the trial personally. But Licona makes no attempt even to argue that Cato Minor was written first. He does address the issue of time of writing near the beginning of the book. This is what he says. Since Plutarch’s biographical project took approximately three decades, there is a possibility, even a likelihood, that he discovered more reliable data that he used when writing the set of six than what he had before him a few years earlier when writing Lucullus and Cicero. This could, though not necessarily, account for some of the differences between the accounts. Accordingly, we are able to detect Plutarch’s use of compositional devices with greater confidence when identifying how he tells the same story differently within the set of six Lives. I have not investigated Licona's citations on which he bases that partial ordering and dating of composition, but suppose we grant it for the sake of the argument. Licona, probably reflecting legitimate scholarly uncertainty, makes no further attempt either to order the six lives in the middle (the word "set" could potentially be confusing, since there doesn't appear to be any reason to think of them as a set in the strict sense) nor to date them more precisely. But as I have pointed out before, new information can be obtained within a short period of time. In the real world, people change their minds about some factual detail within a period of a year all the time, and indeed much faster than that. Merely saying that Cato Minor and Pompey were both composed some time around 110 AD or perhaps somewhat later tells us very little about whether or not Plutarch knew, when he wrote Pompey, what he tells us in Cato Minor about Pompey's personal absence from the court. Licona's brief mention of the possibility of Plutarch's obtaining additional information appears to apply only between groups in his list. He expressly says that we can "detect Plutarch's use of compositional devices with greater confidence" among Lives supposedly composed some time, in some order or other, across a period of a year or two (if this is how we take "perhaps a bit later.") And based upon his practice, this means that he does not even think he has to consider the perfectly simple possibilities that Plutarch forgot something or changed his mind when there is a discrepancy between or among any of those six Lives. In other words, he writes as though he can "detect compositional devices" with enormous confidence within that group once he thinks he has established a discrepancy. This is extremely high-handed reasoning, epistemically speaking. The same reasoning is evident in a case I will plan to discuss at more length in post(s) on more examples from the gospels. When discussing how many days Jesus was on earth after his resurrection, Licona is quite definite that Luke deliberately made it look like Jesus was on earth for only an extremely short time, even as short as a single day, when he knew that this was untrue. His reasoning in part (p. 177) is that, since in Acts 1 Luke says that Jesus was on earth for forty days, the somewhat rushed portrayal of his post-resurrection appearances in Luke 24 must be deliberate compression in Licona's fictionalizing sense of the word--trying to make it look like events took less time than they did. I completely deny that the indefiniteness of the time indicators in Luke 24 means that Luke is "putting" these events all on one day. I think he just was unsure at that time how long Jesus was on earth after his resurrection, was rushed (perhaps because of running out of scroll) and deliberately left the amount of time unstated, giving a brief summary rather than trying to "make it appear" that any particular amount of time was involved. But Licona's further inference from the clarity of Acts 1 is almost shockingly poor reasoning, given that we know full-well that Acts was written later than Luke! Why would we not infer that the greater clarity in Acts indicates that Luke received further, clearer information in between the writing of the two works? But Licona does not even discuss that possibility. He seems to think it sufficient to jump from "The author knew this at some time" to "The author must have known this when he was writing the other document," which is by no means a sound inference. The case of Pompey's illegal encomium, then, though it gets past the first stage of the flowchart, stalls at the second. Indeed, I am struck by the fact that often neither Licona nor anybody he cites on this subject seems to think it incumbent upon him to argue for anything past the first stage. They usually seem to think it sufficient to say, "Look! A discrepancy! Behold a literary device!" And when any argument is offered, it is something so feeble as the mere fact that the author knew the facts at some other time. Let us consider, instead, the fact that there is nothing particularly modern about poor memory or getting new information. By the same token there is nothing particularly "ancient-looking" or culturally alien about a mere discrepancy between accounts, as in the case of Pompey's encomium. This point--that nothing about this discrepancy requires a special "different culture" explanation, that discrepancies or apparent discrepancies in documents "look" as modern as they do ancient--is also applicable at the next stages of the flowchart. For suppose that somehow or other you had good evidence that Plutarch must have known while writing Pompey that Pompey didn't come personally into court. Hence, you knew that Plutarch deliberately decided to fudge the truth in writing that he did. In that case, why not just think that Plutarch was a somewhat unscrupulous writer when it came to telling the truth? Is there something special about the so-called "ancient world" that made men more scrupulous as historians (though "scrupulous" in a very odd way), so that they would never alter the facts in what they wrote unless they regarded themselves to be "licensed" to do so by a "literary device"? That would be a ridiculous supposition. Did nobody ever twist the truth just because he felt like it, or because he had an agenda, as news outlets and others do nowadays all the time? Given these considerations, where is simple or garden variety unconcern for truth, as opposed to specially licensed "literary artistry," in Licona's toolkit when it comes to explaining a discrepancy? It is nowhere to be found. So even if somehow or other this discrepancy made it past the second stage of the flowchart, and we concluded that Plutarch must have changed the facts deliberately, that doesn't get it past the other stages. I caution against being hasty to conclude that an author changed the facts deliberately while simple error or new information are still live options, but I caution even more against constructing a large superstructure of literary "agreement" between author and audience that the truth on the point in question just does not matter and that the writer does not expect to be believed on that point, even if one concludes that the author did alter the truth on purpose. Last of all, I'd like to discuss a (mildly) interesting case in Tacitus where Licona seems unaware of a change in analysis on the part of the scholar he cites. Licona accepts unhesitatingly both Mellor's evaluation of the effect of the bronze inscription upon the historical facts and Mellor's lecture on Tacitus' laissez faire attitude towards literal truthfulness. I was curious to find out a little more about what this was all about. Why do we think that Tacitus places the trial in the spring of 20? (After studying Licona's book for a while I was well aware that confident statements that a writer "puts" an event at a certain time or "makes" events happen in a certain order are often based upon shaky interpretation.) What did the inscription say, and why did it cause historians to decide that Tacitus was wrong? Most importantly, why in the world is Mellor so incredibly confident that Tacitus did this deliberately and didn't just make a mistake (of seven months or so!) concerning the precise time of a trial that occurred before he was even born? So I did some digging, and here is what I found. First of all, the inference as to where Tacitus "places" the trial of Piso is pretty well-grounded, though entirely indirect. Without boring the reader further by quoting Tacitus (the relevant section can be found here), I will summarize by saying that Tacitus' dating of the trial is inferred by noting where he places an "ovation" (a kind of celebratory parade) in praise of a different fellow named Drusus. This ovation can be independently and precisely dated by Roman public records of festivals known as the fasti. This very indirectness is an argument right off the bat against Tacitus' having deliberately altered the time of year when Piso's trial took place, for it makes no particular difference to the story. Tacitus could easily have left out the somewhat tedious details about how Drusus delayed and then later accepted his ovation if he wanted to make his narrative flow more smoothly, and Tacitus makes nothing out of the time of year of Piso's trial. Mellor's slightly pompous (to my ear) reference to "moral truth" conveyed through a "persuasive narrative" is left hanging out in the wind when one sees how utterly Tacitus fails to emphasize or do anything with the time of year of Piso's trial. What "moral truth" did the indirect references to Drusus's ovation, interspersed with the story of the Piso affair, convey? How did they make the narrative more persuasive of some point? How did putting them in just that way make the narrative better? Mellor does not trouble to say. Perhaps he could make something up if he tried (modern classicists, New Testament scholars, and other literary critics get pretty creative with such conjectures), but the fact that Mellor doesn't even bother is an example of the utter casualness with which it is apparently fashionable in some scholarly circles to hypothesize deliberate alteration. With a certain audience, the mere reference to making one's narrative "better" (somehow) and conveying a higher or moral truth is sufficient, and no one bothers to ask, "For goodness' sake, how does this point even begin to convey a higher truth? How does it even make a better narrative? Why in the world would the author bother deliberately to alter so trivial a matter and convey the alteration in so indirect a manner?" But it gets better. I looked into the bronze inscription, too. As it turns out, as discussed in The Latin Historians by C.S. Kraus, A.J. Woodman (1997), pp. 100-102, the bronze inscription with the senatorial decree itself was published in December of 20 AD. I haven't been able to find a copy of the decree. Based on Kraus and Woodman's description and partial quotations and the description of Mellor (see below) it discussed Piso's actions, his trial, how great Tiberius was, how Piso was guilty as heck, and so forth. It also said that its purpose was to make it possible for the stages of the case to be "transmitted to the memory of posterity." But it did not date the trial! The conclusion that the inscription contradicted the indirect dating of the trial in Tacitus was entirely an inference based on the date of the senatorial decree and on the premise that the Senate would have been more likely to issue its own official summary of the affair very shortly after the trial rather than seven months later. Kraus and Woodman appear to endorse this inference, but fortunately they at least lay out the reasoning so that one can decide for oneself how much weight to put on it. They also make it clear that the view of Tacitus as generally being loosey-goosey with the literal truth was not the view of Tacitus taken by the majority of historians at the time when the inscription was discovered. Kraus and Woodman are apparently advocating such an "overhauling" on the basis of a single instance, though they provide little in the way of argument that Tacitus' dating would have been a deliberate change, as opposed to an error, even if it were wrong as they believe. Mellor in 1999 makes it sound as though everyone knew that Tacitus, as one of those ancient chaps writing moralistic history, cared nothing for accurate dating, but this does not appear to have been the consensus about Tacitus at all prior to the discovery of this one inscription. In any event, the inference from the dating of the inscription to the dating of the trial looks quite shaky. Kraus and Woodman call it a "natural inference" that the trial had just concluded before the decree was published on December 10, but it is unclear why. Even in our own day, there is often a political reason for making some official statement about a series of controversial events that occurred quite a while previously. Think of our endless investigative committee reports. Kraus and Woodman do raise the possibility of a (relatively short) gap between the trial and the senate decree and imply that some historians were taking that view, though they are unconvinced by this theory. But apparently someone else was convinced by it. Ronald Mellor! In 2010, in an edition of Tacitus' Annals, p. 36, Mellor states unequivocally that “the trial of Piso took place in May of 20 C.E.” Nor is he talking about how Tacitus makes it look. On the contrary, by 2010 Mellor had an idea of his own about the political reasons why the Senate decided to make a decree in December about a trial that had taken place in May. In other words, over a period of about ten years, Mellor had evidently changed his mind and decided that Tacitus didn't alter the facts after all when he indirectly indicated when the trial took place. I do not bring this up to blame Licona for not finding it. He accurately quoted what Mellor said in 1999 and had no way of knowing that he wrote something different in 2010. I stumbled upon it while researching the details of the claim that Tacitus deliberately changed the trial date because reporting such things accurately was not important to an ancient "moral" historian. When we look into the details, we find, as in the Plutarch instances I have discussed, how weak the argument is that the historian deliberately changed the facts or even, in this case, that he got the facts wrong at all. As you know, Dr. Licona's case involves providing examples of secular historians availing themselves of the literary devices in question. I do not think it would help his apologetic case to suggest that some of these examples could be simple fabrication or carelessness. This would be proving too much, would it not? If the gospel writers followed well-known secular historical convention, and other (secular) historians could be shown to be factually suspect, even for ancient standards, then the apologist is back to square one -- giving evidence for the plain-Jane historicity of the gospels. For most unbelievers, the gospels are at least a little suspect anyway, because of miracles and christological agendas, etc., so I don't know that we can avoid square one, in any case. It just isn't a "convention" to engage in simple fabrication or to make a good-faith error. (Whether that error involves carelessness or not.) There's nothing literary about it. It's normal human activity, something that happens through all ages, something that varies from one writer to another, and so forth. It isn't a "secular historical convention" for Plutarch to mess up! It isn't a "convention of the time." It's just Plutarch messing up. Same for Plutarch having an agenda and being misleading just because he has an agenda. That isn't a convention, and it isn't something someone else is bound to follow. Moreover, that's precisely the kind of thing that varies *a lot* from one author to another. The fact that, say, Alex Jones puts forward wild conspiracy theories in our own day doesn't mean that some other news site is likely to do so. The fact that Author A makes a mistake doesn't make Author B particularly more likely to do so just because they are writing within 100 years of each other. So if Plutarch made a mistake or if Plutarch fabricated something, that doesn't tell us anything about the gospels. The reason that Licona makes such a big deal about these as conventions and "devices" is *so that* he can port them over to the gospels as "accepted in the day." But what if he's wrong? What if they aren't "devices" at all but just ordinary behavior of a writer? In many cases, no real discrepancy at all. In some cases, error or fabrication. Well, okay, then Licona's whole project is built on sand, and Plutarch doesn't tell us anything useful for our understanding of the "compositional devices of the culture." I think the apologist *should* give evidence for the plain-Jane historicity of the gospels. And it works! There is lots of such evidence. But this has nothing to do with their "following well-known historical conventions." It has to do with their just *being* historically reliable. But if, on the other hand, we hold that they followed "conventions" that *permitted* them to be historically *unreliable* (and I do not care that Licona does not *like* that characterization, but that is what his position amounts to), then that is a very serious problem from an apologetic point of view. So far from being a help, it is a huge blow to Christian apologetics. If it were true and could be shown to be true, we'd have to figure out what in the world that means for the case for Christianity. 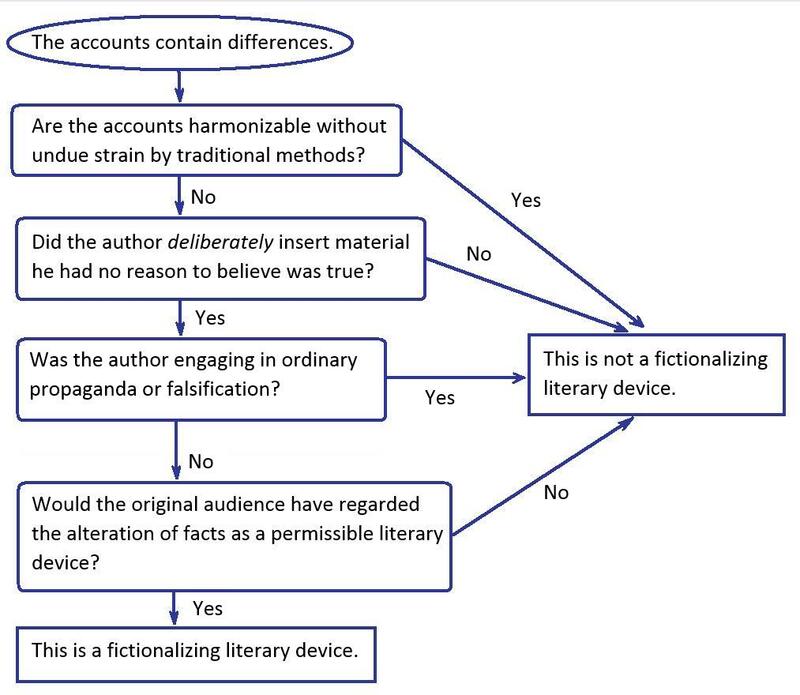 But it isn't true, and Licona has no evidence for this whole thesis about fictionalizing "literary devices." And the fact that he has no such evidence can be seen in part by the fact that he doesn't even have a good case for such devices *in Plutarch*, so ipso facto he can't port them over from Plutarch to the gospels. Even if he could find them in Plutarch, it doesn't follow that he could port them over. But he does not even show his case at square one. And, yes, the possibility that Plutarch made garden-variety errors is part of the *reason* for the failure of the case at this point. But that doesn't mean that I'm saying that there was an "historical convention" of making garden-variety errors! Garden-variety errors are not conventions. Let me also point out that we want to know what really happened. If it is a much simpler and more probable explanation that Plutarch made a mistake about something than that he had this "literary device," then that's what we should believe. It would be completely illicit to *invent* a "literary device" theory *for Plutarch* because we think this will "help our apologetic case." As a matter of fact, it is just the opposite: This "literary device theory" for Plutarch, and then porting that over and attributing it to the gospel authors all over the place, as Licona does, is *terrible* for apologetics. But at the first step, where we are asking, "What is the true explanation for a discrepancy in Plutarch?" we should just be trying to figure out the answer to the question, not saying, "Hmm, I'll say it's a literary device because that's what I want to use for an apologetic purpose I have in the back of my mind." That would be very poor historical practice. In any event, it would be silly to worry that attributing simple error to Plutarch somehow impugns the reliability of the gospels. Why would anyone think that? It's only when you add a further, utterly unjustified assumption that the gospels couldn't be any more reliable than Plutarch that somehow toting up errors in Plutarch becomes a problem for the gospels. Though in fact, as I've said elsewhere, reading Licona and studying his examples has actually caused me to come away with a higher opinion of Plutarch's boring, factual accuracy than I ever had before. Definitely not the effect Licona intended, of course. In my estimation, it is incredibly difficult to prove, at this late date, that an author like Plutarch intentionally changed a factual point and that it was considered acceptable. Even the first half, that he made a change *intentionally* is very hard to establish, given (a) the difficulty they had in getting reliable records (and so there is always the potential for an author just making a mistake based on ignorance), and (b) the difficulty of OUR finding records that definitely clear up just which account is the correct one, rather than being stuck with a discrepancy and no resolution. But even once you prove that, as hard as it is, then you still have to establish that it was accepted as an approved way of altering the account of reality. Frankly, so far as I have seen so far, the arguments are all based on rather significant hypotheticals and conjectures. You aren't going to get them better seated until someone comes forward with a contemporaneous ancient text that EXPLICITLY lays out "here's an interesting device that Plutarch used, we all knew he was playing with the data, but we thought it was well done as he made such a good story out of it." Show me a text like that, and I give the theory much more credence. Until then, the conjectures will remain just conjectural. Heh. Thanks, Tony. God is also said to be in the details, but hopefully that just means I'm finding God by noticing details. It struck me so forcefully that apparently *until* that inscription was discovered, Roman historians took Tacitus to be affirming what he said about the events surrounding that trial and took it to be good evidence on that boring, factual subject. It was only *after* they found an inscription that some of them *took* to contradict Tacitus that we got all of this wugga-wugga about how "[Tacitus] would regard the precise date of an event as of no greater importance to an historian who seeks to convey moral truth through a persuasive narrative." If that was what they thought about him *in general*, then why did they accept his account of the trial and its surrounding events *in the first place*? All of these high-flown generalizations, if the historians really took them seriously, would undermine their own practice all the time, at multiple points. So they just trot the generalizations out when they find them convenient and quietly pack them away when they want to use Tacitus or someone else as a source for factual historical knowledge. What is particularly alarming, though, is that New Testament studies was *already* well-oiled for doubting the historical genre and factual accuracy of the gospels more globally. This has been true for well over a hundred years. So in NT studies I think even "evangelical" scholars who accept the fictionalizing device theories will end up being more...consistent in their application of doubts about factual historical accuracy than Roman historians are. Which is to say, the gospels will be doubted at more and more places, even when there is no discrepancy. The recent flap about the "I am" sayings in John illustrates this, as do several examples from Licona's book, such as his completely gratuitous doubts raised about the Doubting Thomas sequence. (Yes, in the end he came down in favor instead of Luke's having deliberately "conflated" two events rather than John's having deliberately made one up out of whole cloth, saying that the former was "more probable." What a great relief! What a ringing endorsement of Johannine historical reliability!) Or an even more striking example, which I discussed in my response over at Extra Thoughts, the out-of-the-blue claim (which he *does* endorse) that John invented "I thirst" as a "dynamic equivalence" for "My God, why hast thou forsaken me." There is not the slightest *appearance* of a discrepancy there, but suddenly we're needlessly going all "literary" on a simple expression of thirst by a man in the midst of crucifixion. All of this "literary convention" stuff will just put a new suit of the emperor's old clothes onto widespread, destructive redaction criticism, which has just been waiting in the wings for what sounds like a "respectable, evangelical" excuse to come back onto the stage. It's very sad, but it's what's happening. You do beat all! Who else would follow the professor into Plutarch! Who else, but Lydia, would go into his staked-out domain and take him on there! It seems that honor should compel the professor to face your arguments. Every advantage would seem to be his, save one that is yet in question: who has the advantage of siding with truth and reason? Notice, too, the phrase in Cicero (!) that with these supporters Pompey "came forth" in the eventual confrontation. Came forth *from where*? Well, from his house, for as we learn from Pompey, he had retreated to spending all his time there and not coming into the forum! But there isn't any earlier hint of this in Cicero. So once again the two accounts fit together very well. What is your advice to atheists who argue that the ceaseless disagreements between even conservative Christian scholars on what the NT says and means, rationally warrant an unbeliever to conclude that those issues really aren't capable of reasonably certain resolution, and to therefore refrain from investigating them? Seems to me that W.L.Craig's disagreement with Copan/Flannagan on whether the bible portrays God as commanding infanticide, including your own claim that you hope to find out, after you get to heaven, what those passages really mean, rationally warrants the unbeliever in characterizing the whole business as too convoluted to deserve investigation. Seems to me that with scholars like you and James White disagreeing so much with Licona on his conclusions and methodology on gospel differences, this rationally warrants the unbeliever in characterizing the whole Christian theodicy business as too convoluted to deserve investigation. Seems to me that Norman Geisler's disagreement with Licona about inerrancy and apologetics methodology, rationally warrants the unbeliever in characterizing the whole business as too convoluted to deserve investigation. Seems to me that if Geisler and Harris can disagree with each other about whether Jesus rose bodily from the dead (JETS 33/3 (September 1990) 379-382), with Beckwith weighing in and being "overwhelmed and impressed by Harris' scholarship" (JETS 33/3 (September 1990) 369-373), this rationally warrants the unbeliever in characterizing the whole business as too convoluted to deserve investigation. Seems to me that the series "Counterpoints", in having Christian scholars debate each other on numerous topics from hell to historical Adam to apologetics methodology, rationally warrants the unbeliever in characterizing those biblical and philosophical subjects as being too convoluted to deserve investigation. If you are aware that spiritually alive people cannot resolve these matters, then must you not conclude that spiritually dead people are only going to fare worse if they dare enter the fray (i.e., isn't it irrational to classify spiritually dead people as 'unreasonable' for their refusal to investigate biblical matters)? Being spiritually alive has zilch to do with it. I'm an epistemologist and a professional philosopher. I'm all about the arguments. I don't think the Holy Spirit is zapping either me or Mike Licona, especially not in our understanding of Plutarch, for heaven's sake. It would be absurd to suppose that I'm calling any other Christian's relationship with Jesus or eternal destiny into account by disagreeing on these matters. We have to do the hard work of following the arguments and making up our own minds, which is an attitude one would think a skeptic would welcome. I've laid out arguments (in this post, concerning Plutarch, in case you didn't notice). If you're actually interested in the subject I'm discussing, rather than in spamming my comments threads with other topics, I suggest that you read and study the arguments and see who you think has the better of the argument. But I honestly doubt that you have much interest in the differences of opinion between myself and Licona on these points, as your many comments virtually admitting as much and attempted topic shifts have shown. I suggest you stop it. We do have a banning mechanism.